No matter what the size, we can help you to create signage that will help your brand to stand out and make an impact. Choose from a wide range of materials, including acrylic, foam, PVC, aluminium and composites. Depending on the look you are going for, each of these materials have their own advantages. 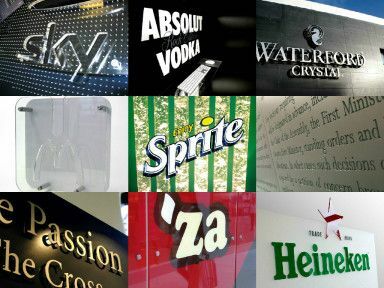 Have a look through our gallery page for some examples of our signage projects. We can also provide you with illuminated signage, which will draw even more attention to you and your brand. Lighting can be incorporated in many different ways. We are open to suggestions and ideas and love working on new concepts. 2D and 3D cut letters in acrylic, foam PVC aluminium, composites. Fascia sign boxes cut in acrylic composites. Eye catching signage is essential to letting your customers who you are. It is vital to give off a professional image that reflects your brand. Choose from something sleek and modern to something more funky and fun. Establishing your brand and reinforcing its identity will go a long way to ensuring your customers remember you, whilst creating brand awareness for potential clients.